At Badain & Crowder and Resolve Attorney Mediators of Rochester, we focus solely on matrimonial and family law. Our goal is to help families overcome challenging legal issues in a way that works best for them. To that end, we offer mediation services for all aspects of divorce, separation, custody and prenuptial agreements. We also provide guidance and advocacy in traditional family law cases. As mediators, they apply a wealth of experience to resolve complex family law issues, sparing clients the stress and expense of litigation. As lawyers, they zealously advocate for clients’ interests, whether in court or out. As court-appointed attorneys for children, they shoulder the important responsibility of protecting the best interests of children. As parenting coordinators, they use mediation to resolve especially tough cases that courts send their way. Additionally, Ms. Badain authors a monthly legal column for StepMom Magazine, writing on a wide range of family law issues that many clients find relevant to their lives. Find out more about our lawyers’ backgrounds through the links below. We focus on a different approach to resolving tough legal issues — one that gives you a voice in a comfortable and cooperative atmosphere. We designed our office with that focus in mind. 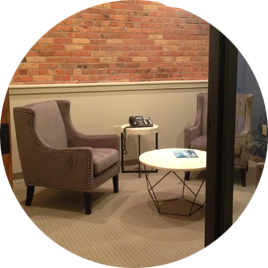 Located in a renovated carriage house in the historic East Avenue District of Rochester, New York, our office provides a warm and welcoming environment that fosters productive communication. For more information about any of our services, please call 585-256-2109 or send us an email. We offer convenient weekday, evening and weekend availability to better accommodate your schedule.